Urban Initiatives’ Community Resource Coordinator William Green is helping kids and families in Englewood take ownership of their school. For the last 13 years Urban Initiatives has provided many opportunities to make change in Chicago through academic success, healthy living, and leadership development. At the start of the 2016 – 2017 academic year for Chicago Public Schools, Urban Initiatives has taken their impact to another level and I was given the opportunity to be a part of the new direction. 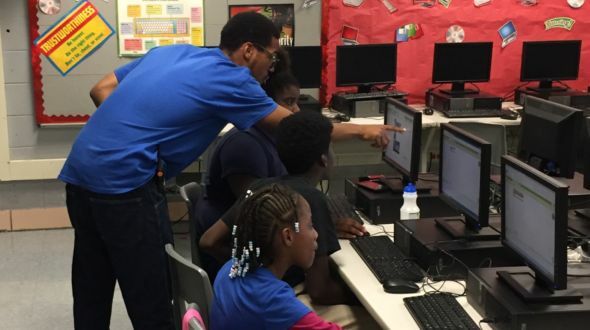 For the first time, Urban Initiatives was chosen to serve as a lead partnering agency with a Chicago Public School through the Community School Initiatives Program. This partnership was made possible through a grant from the Nike Community Impact Fund and the South Chicago Nike Community Store. Late August, I was offered the position of Community Resource Coordinator assigned to Martin Luther King, Jr. Academy of Social Justice in the Englewood community. My duties include connecting with program providers, scheduling after school programming, recruiting students, and monitoring attendance. I was very excited about this opportunity, allowing me to use my experiences and skills in the education arena that included administration, operations, mentoring/coaching, security and discipline. Located at 644 W. 71st Street, King Academy has experienced major changes recently. Those changes include the name of the school, formally Hinton Elementary, the curriculum focus, and a new Principal, Jasmine Thurmond who stated, “…the students are being prepared for the responsibility of accepting these changes and improvements, they have come a long way and sometimes they just need a little love to help them along the way”. Working closely with Andy Neilsen, U.I.’s Director of Coaching and Training, we began to outline our initial strategies knowing that support from all entities that make up King Academy – students, parents, administration, and teachers – is essential to build a productive program. There was no way we could come through the door, though with positive and joyous intentions saying, “Hi! We are bringing new and exciting programs to King Academy… these are our programs… this is what we have”. We had to make sure there was a balance of communication, making sure everyone felt like they are a part of this new adventure. I believe that one has to be aware of the needs of the community before you begin serving them. In order to find the needs of King Academy’s students and community, Andy and I knew I had to spend 8-10 hours every day, not in the office of Urban Initiatives but directly in the school. I had to engage the students during recess, lunch, in the hallways during bathroom breaks, and when conflict resolution or de-escalation procedures were needed. I knew I had to engage the teachers and administration by letting them know I would be there to support the culture and climate of the school and assist in maintaining classroom management. Finally, one of the biggest challenges was to dispel the notion that parents did not feel welcomed. I engaged the parents by greeting them before school or at dismissal, introducing myself and taking the time to inform them of our plans, being completely transparent, and available to answer any and all of their questions. 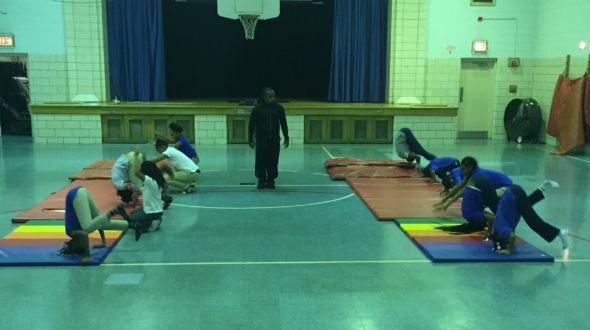 As of today, we have a variety of programs: Gymnastics; Martial Arts; Spoken Word/Poetry; Computer program and coding; Hip-Hop and African dance; Lego Robotics; and male and female mentoring programs. With a student population that consists of 200 students we have 80 students enrolled, which is 40% participating in our programs. Our goal is to have 50% of the student population enrolled in these programs. I expect to exceed that goal by the second semester with more programs on the horizon, including Work to Play Soccer in the Spring and Parent Workshops including resume writing, computer literacy, job readiness, and a mentoring program. Following Principal Thurmond’s vision, along with the continued support of the parents, students and staff, King Academy will become the beacon of excellence in the Englewood community. Thank you Nike for helping Urban Initiatives expand their sports-based youth development programming into Englewood at King Academy through the Nike Community Impact Fund.